I dropped by the Museum of Modern Art in New York City the other day for a quick art fix and ended up at the exhibition: Talk to Me: Design and the Communication between People and Objects. It’s an ambitious effort to examine the interface designs between humans and objects, something we deal with a lot in the tech world but not necessarily from the designers point of view. The results are interesting with a design-centric sensibility harnessing trendy tools such as QR codes, smart phones, and Twitter hashtags in an effort to enhance human interaction with the exhibit itself. 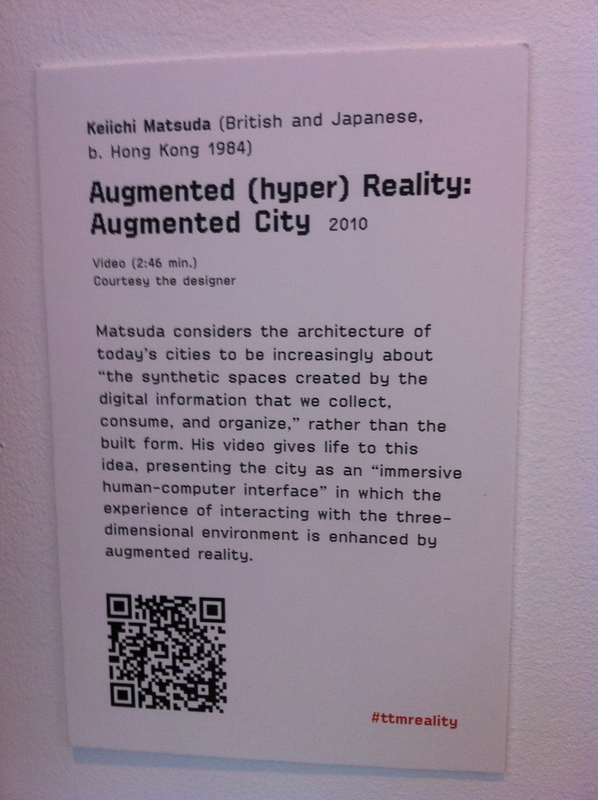 One piece in particular caught my eye Keiichi Matsuda’s Augmented (hyper) Reality: Augmented City 3D, a short film illustrating augmented reality (layering computer-generated visual information over a real life view.) 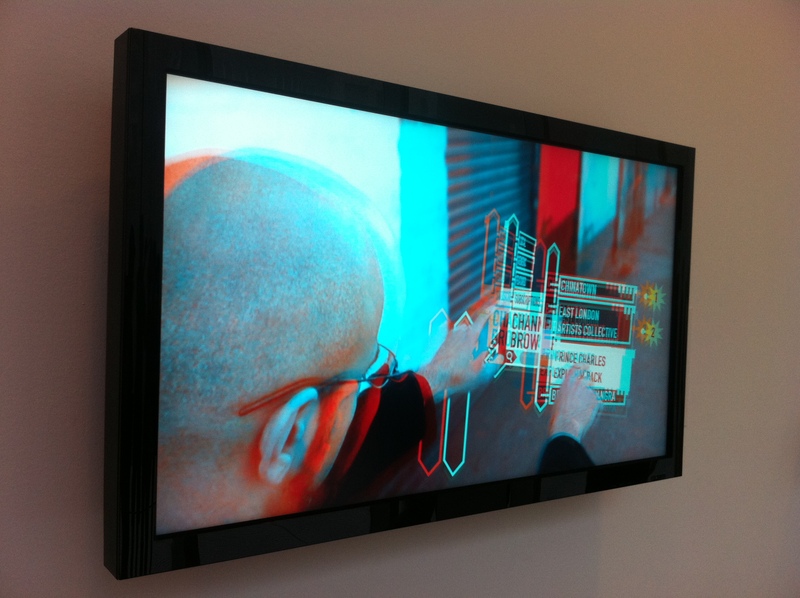 It’s an interesting concept and the design is beautiful, but what caught my eye were anaglyph glasses dangling across from the piece inviting viewers to watch in 3D. 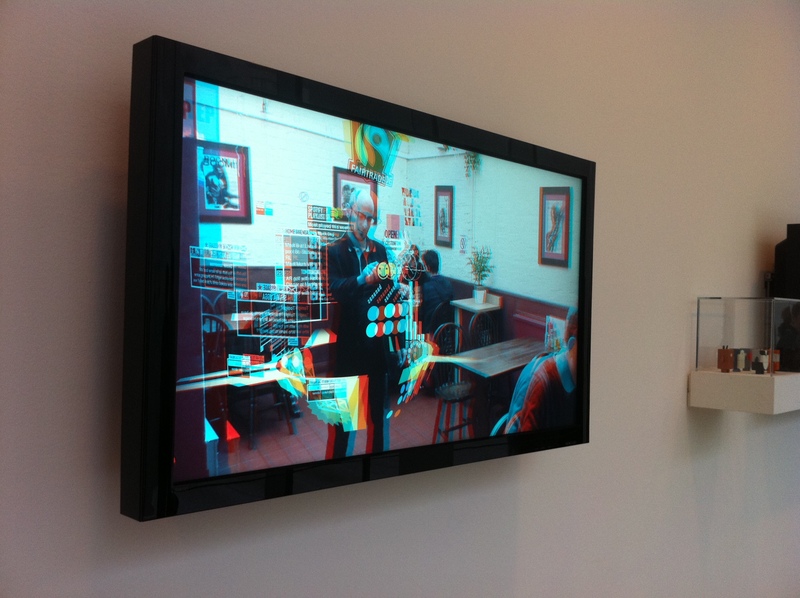 The piece is displayed on one of many video monitors hung down a long, sunlit corridor. These are terrible viewing conditions in every way (too much light, people jostling as they past) but it was irresistible for a lot of people, including me. The 3D optics aren’t great, but it is enough to give a better sense of the immersive quality of augmented reality, something we’ll be seeing more of I’m sure. 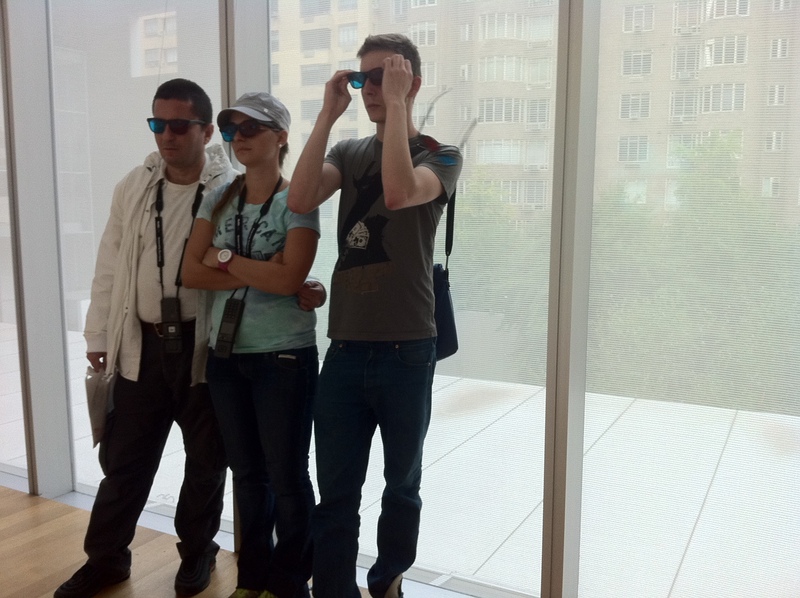 It’s also a testament to the power 3D has to command attention. The show runs through November 7, 2011. I highly recommend it. This entry was posted in Art of 3D, It's 3Deelicious! 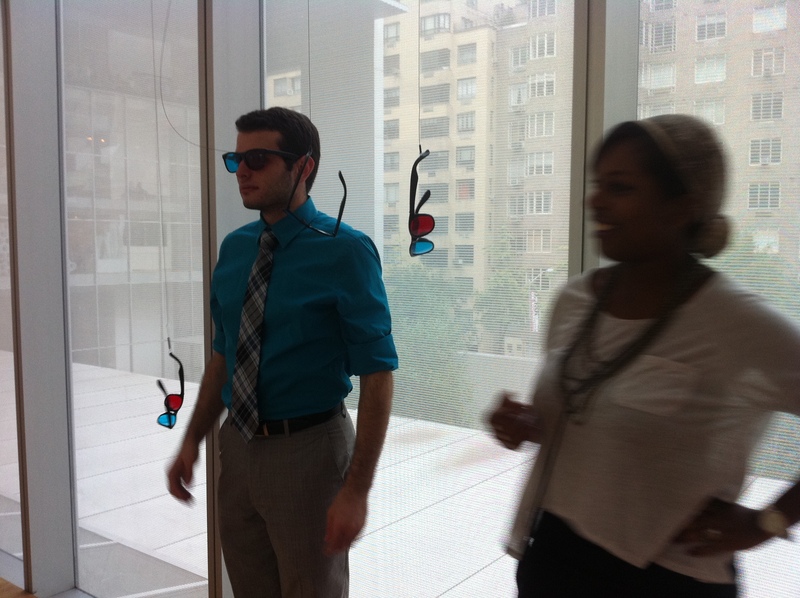 and tagged #ttmreality, 3D art, Anaglyph glasses, augmented reality 3D, Keiichi Matsuda, MOMA by decantu. Bookmark the permalink. Hi there, thanks for posting! I agree the conditions weren’t ideal, and the monitor wasnt properly calibrated. You can see the anaglyph version on my website at keiichimatsuda.com, and download a side-by-side version at keiichimatsuda.com/press. Its also on youtube 3D if you do a search. Thanks…I’ll look! It’s an exciting piece and a fantastic idea.